Cancer May 2016 Horoscope forecasts predominance of career over home and emotional affairs due to the concentration of the planets in the Northern half of the birth chart towards your rising sign. You are at the highest point of your profession and success in job and business will automatically bring personal and family happiness. Independence and self-will will rule over social charm and social grace for the Crabs in May 2016. You have to be bold and follow your own course, and you have the help of planet Mars to do this. You are not dependent on others for accomplishing your goals in life. 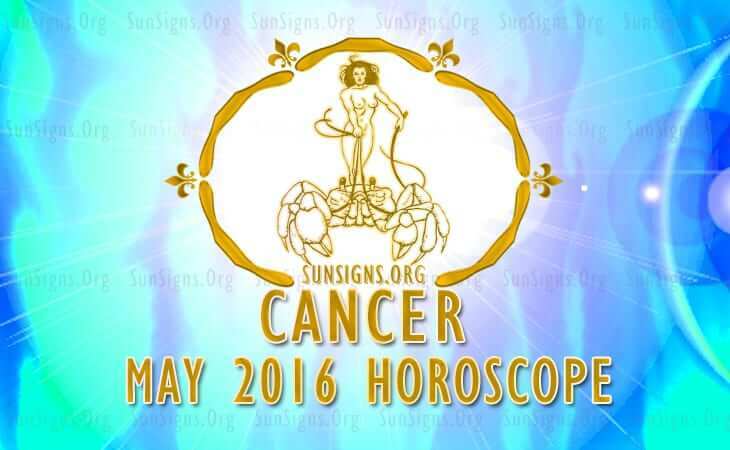 The 2016 May zodiac predictions for the Cancer sun sign foretell that you are motivated to get things done and you have the necessary confidence to attain your objectives. You can boost your confidence by improving your personal image and grooming. Your appearance will be the deciding factor in your professional growth. Humanitarian activities will help you to further your business development. The May 2016 monthly forecasts predict monetary progress will be demanding and requires extra effort during the Mercury retrograde. Conflicts may arise between the Cancerian and their love mate regarding the manner to achieve financial results. Situation will change for the better after the 21st and you will appreciate the efforts of your spouse. Money will flow easily during the first two weeks and the last week of the month. Romantic prospects for single Cancerians will improve after the 21st when they will have more free time to devote for love affairs. Married couples and those in permanent relationships will be short of time for love in their anxiety to attend to the challenges of day-to-day life. Religious activities and the urge to understand your inner self will dominate your interests. The lunar eclipse of the 4th May signals the arrival of a child in the family. Relationship with children will be turbulent. Additional expenses may be incurred due to the activities of kids. The eclipse may help you to enhance your looks and overall Cancer personality. The Cancer May 2016 astrology forecasts predict that your health will be excellent during the month. Influence of Mars will be reflected in your behavior. You will be imbued with more vitality and boldness. Cancer sportsmen and athletes will have a booming period. To conclude, the May 2016 Cancer horoscope predicts a period of professional commitments that make domestic affairs a little complicated.